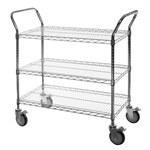 Our NSF-certified wire and solid steel carts have long been a popular choice for restaurants, hospitals, the medical & pharmaceutical industries, and any other business that needs safe, reliable transportation and storage for sensitive items. The solid shelf carts are a perfect solution for hospitals that need to transport delicate substances, and the security carts are ideal for storing valuable devices, controlled substances, or anything else that needs to be protected while in storage. The wire utility carts pair well with our standard wire shelves or our NSF-certified restaurant shelving to create a safe and hygienic storage solution for food service and other delicate materials, or for any general transportation need in the office, the garage, or even the home.